The 3rd grade spelling words for week 22 is made up of 16 words that include double consonant words and academic vocabulary. There are 5 activities to help students master the words: Write it Two Times activity, Circle the Correct Spelling activity, dictation sentences where the teacher/parent says the sentence and the student writes it, Fill in the Blank activity, and Write the Missing Letter Worksheet. 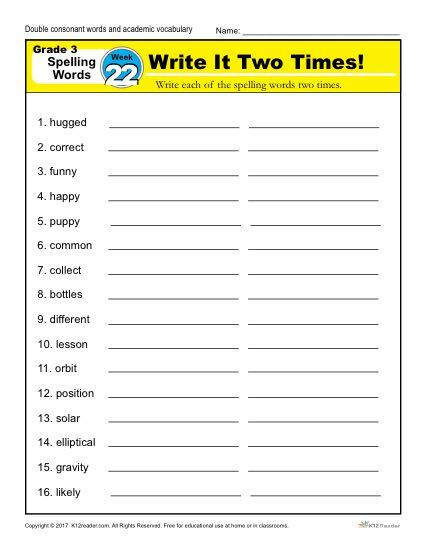 Spelling words include: hugged, correct, funny, happy, puppy, common, collect, bottles, different, lesson, orbit, position, solar, elliptical, gravity, likely. This week’s spelling list is part of our free 36 week 3rd grade spelling program. This week’s spelling list is part of our free 36 week 3rd grade spelling program.